Nifty opened flat, and stayed in a narrow range for the first 2 hours of trade but reacted positively to RBI move which was on expected lines to rally about 150 points from the lows to close the day at 6220.90, a huge gain of 119.80 points. The broader market was positive, with 757 advances to 584 declines. 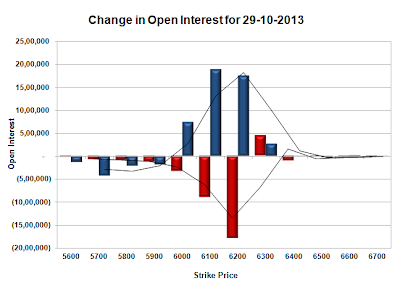 As per OI table the range till expiry moved up a bit at 6100-6280. 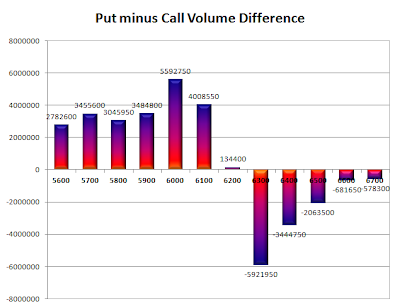 Call option 6300 added 4.44 lacs huge amount of OI with huge short covering seen at 6200 and lower strike prices. Put option 6300-6000 added 46.50 lacs huge amount of OI with profit booking seen at 5900 and lower strike prices. Nifty Open Interest is at 1,28,23,500 down by 13,04,700, whereas Nov Series added huge 53.15 lacs OI, with increase in price, most probably 100% roll-over with huge long build-up. Bank Nifty Open Interest is at 16,02,575 up by 45,275, whereas Nov Series also added 4.30 lacs with increase in price, most probably huge long build-up. FII’s bought huge 17.38 lacs Futures, mostly long build-up, as their net OI increased by 95351 contracts (includes 284061 longs and 249302 shorts) and the average price per contract comes to around 6179.95. FII’s future open contract as on date is 641271. 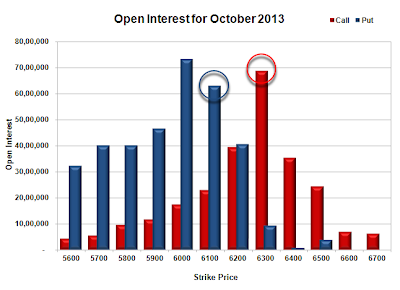 PCR Open Interest (Volume) has jumped to highest point of the series at 1.663. Initial support right now at 6200, with huge addition for the day at 17.53 lacs, below that at 6100, with huge OI of 63.17 lacs. 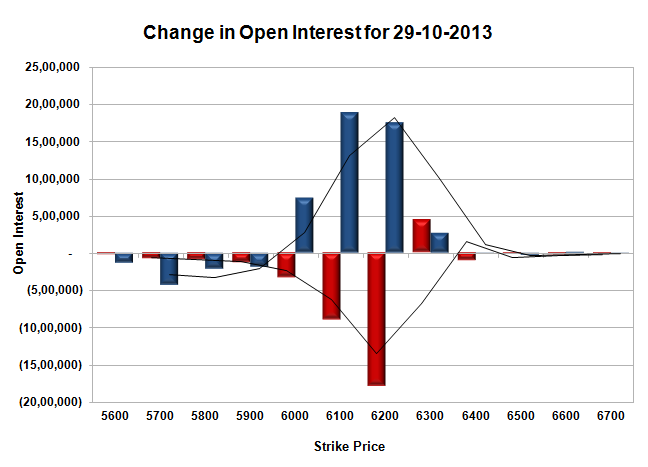 Best Resistance at 6300, with OI of 68.72 lacs. Day Range as per Option Table is 6121 - 6256 and as per VIX is 6157 - 6285 with 6176 as the Pivot.